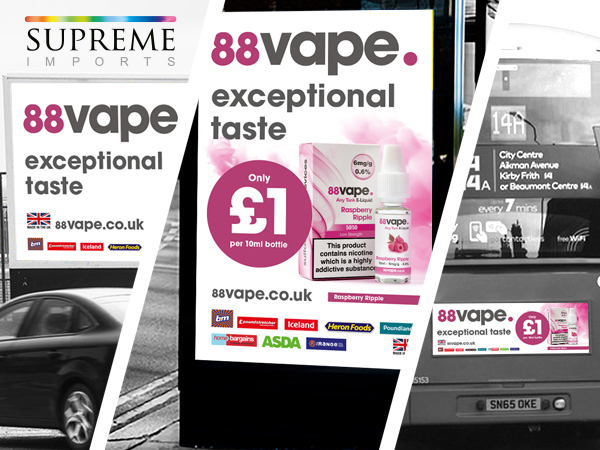 From December 2018 to January 2019, Supreme heavily invested £3m in out-of-home advertising for our £1 e-liquid range, 88vape. Marketing activity consisted of three national outdoor campaigns across different media platforms; 3,000 bus rears, 5,000 x 6 sheets and 700 x 48 sheets, which followed in the footsteps of our 48 sheets campaign that was launched in September 2018. Reaching millions throughout the UK, these campaigns continue to raise the profile and brand awareness of 88vape. 88vape is available to purchase in major retailers including B&M, ASDA, WH Smith, Iceland, The Range, Home Bargains and Heron Foods.